Loaded Nacho Soup is a quick weeknight fix! It’s time for Soup Saturday Swappers! 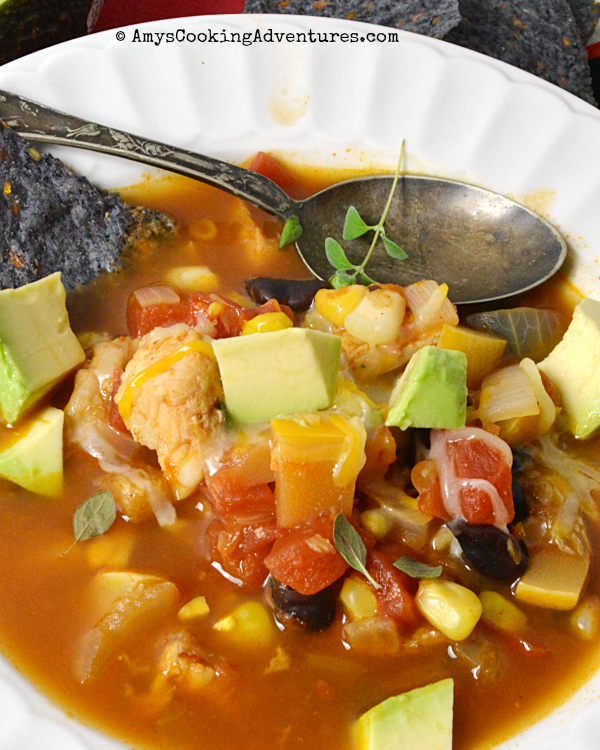 This month’s theme is Mexican Soups! Chicken Tortilla soup is usually my go to Mexican Soup, so this time I needed to think outside the box. I started thinking about my chicken tortilla soup plus all that deliciousness I love on some loaded nachos! I kept a pretty heavy veggie profile with this soup, (since I knew no one in my family would touch a veggie on soup night), then I started throwing in my favorite toppings: tomatoes, chicken (beef would work too, just brown it first), beans and corn, and of course some amazing spices. I kept the cheese, chips, and avocado as toppings, sitting in soup just wouldn’t do them justice! This soup was so delicious, especially with a squeeze of lime! Heat the oil in a large soup pot over medium heat. Add the onion, garlic, and jalapeño. Cook until the onion is tender. Stir in the remaining ingredients (except toppings). Simmer for 20 minutes or until the chicken is cooked through. Remove chicken, shred, and add back into the soup. 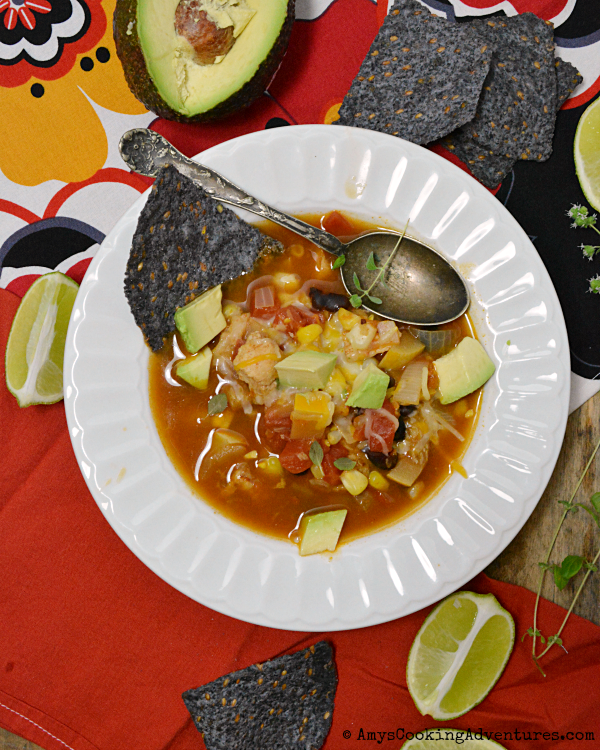 Divide the soup into bowls and top with a squeeze of lime, diced avocado, shredded cheese, and tortilla chips, as desired. Wonderful! Loaded soup, that is great! Love the chunks of avocado on top.... superb! Your soup sounds and looks wonderful Amy. Don't you just love being able to add wonderful toppings? They are this the wonderful treat that you get to add to the top of an already delicious soup! I love that you used squash in this soup! Was it butternut squash? That sounds delicious Amy! Perfect for week nights! I love an easy to make dinner for weeknights and this fits the bill exactly-yum! So delicious, love this loaded nacho soup. Love all the veggies in here, and quick and easy to make as well. Win Win. Now this is the way to eat soup...topped with all the yummies!